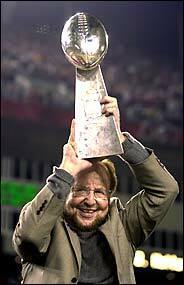 I firmly believe Malcolm Glazer is the most hated American in Ireland. You might imagine that it would be former President Bush or some American corporate big shot who's recently sucked the lifeblood out of an Irish city - Michael Dell anyone? - but I don't think so. No, I'm pretty sure Glazer is the most hated. And I do mean hated. You won't find his name reviled in letters to the Irish Times or Irish Independent nor will you see street protests denouncing him nor find public representatives spewing venom about what a reprobate he is so it could easily pass you by. However, if you wander into a pub - particularly a pub in working class area of one of Ireland's cities - and you ask a few red-scarfed locals what they think of Glazer (photo) the air will quickly turn blue. Why red-scarfed? Well, not any red scarf, but the red scarf of Manchester United, "the world's biggest football club" and the most popular English Premier League team in Ireland. Glazer is the team's controlling owner and, well, fans are not too keen on his modus operandi. 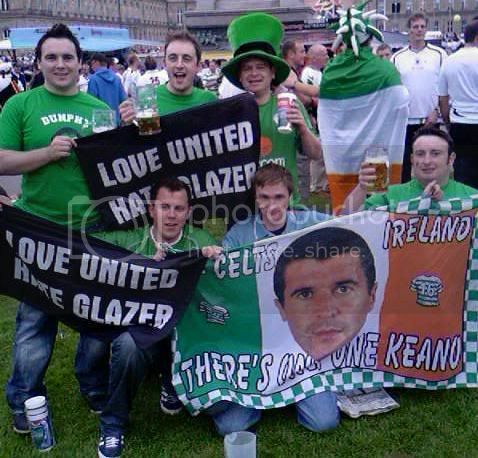 Irish fans of United are not alone in their detestation of Glazer. English, Scottish, Welsh, Norwegian, and so on fans all feel the same way. They hate him. Oh and not just him, his whole family, especially those who are closely involved in running the club. Unfortunately some of the hatred has spilled out of the tank of logic and some of these fans have extended their hatred to all Americans, or more, typically "f***ing yanks." If you'd like to get a sense of the depth of feeling Glazer and his family have engendered in the fans of Manchester United a few minutes reading at MalcolmGlazer.com (and there are plenty of other such web sites) will give you a taste. It's not for the faint-hearted or the easily offended. An R-rating at a minimum. Funny thing is you may not have ever heard of Glazer before. He owns the Tampa Bay Buccaneers, which he bought eight years before he got control of Manchester United. Another funny thing is, unlike the Buccaneers, whose on the field performance has varied from mediocre to Super Bowl champions to mediocre to joke during Glazer's time, United has been almost spectacularly successful since Glazer bought the club, which begs the question: why do the fans hate him so much. Well, the fans credit the club's legendary manager, Scotsman Alex Ferguson, who is a sort of gruff version of Joe Torre. During Ferguson's 23+ years managing United - the Yankees of English soccer - the club has won 11 league titles, a couple of European Champions League titles, FA cups and other trophies. That is, they were wildly successful before the Glazers got involved and have remained successful. The on the field performance - so far, this year's looking shaky - is not at the root of the fans' problems with the Glazers. What bothers the fans is the club's finances. You read that right. The Glazers' acquisition of Manchester United was financed with debt - lots of it, now estimated at $1.145bn. Immediately the fans were on edge fearing - rightly - that the new owners would have to raise ticket prices to pay down what they owe. That's only a small part of the problem, however. The press has been full of stories lately about the precarious financial position at United. Credit crunch and all that. Fans see the Glazers' financial troubles in the club's failure to go get a big name player to replace Portuguese glamour boy Christiano Ronaldo, who left United at the end of last year to play for Real Madrid. They believe the club is being driven down by the Glazers' debts. Today's Irish Independent says the club's recent bond prospectus provides for all sorts of income to revert to the Glazers at the expense of the club, something the fans have foreseen since the Glazers first took control. The message boards and blogs are already afire with this latest revelation. Last weekend fans called on Ferguson (Sir Alex as he's known on British t.v., as he's been knighted by the Queen) to resign in protest, something that he seems unlikely to do. Regardless, the Love United Hate Glazer Facebook campaign will not be going away any time soon. Glazer will continue to be a source of anti-Americanism, just when it looked like things were getting better for us 'Yanks'.